The 2014 wide receiver class might end up as one of the best of all time, a complete draft outlier featuring guys like Odell Beckham, Sammy Watkins, Mike Evans, and Allen Robinson, just to name a few. It wasn’t long ago that the 2015 running back class was thought to be just as strong. After year one, you could form a strong argument that they will never enter the same stratosphere as the 2014 wide receivers, as far as level of depth and superstardom. Yet my gut tells me giving up on this class after year one would be an unprofitable mistake in fantasy football. A good portion of my 2016 Rushing Expectation project revolved around the 2015 running back class. I’ve already profiled the likes of David Johnson, Thomas Rawls, Duke Johnson, Matt Jones, Melvin Gordon, and Jeremy Langford. Even guys like T.J Yeldon, Tevin Coleman, and Jay Ajayi were a part of my initial 20-player sample and will be profiled before Week 1 of the NFL season. Who from this entire group who do I think is poised to join the likes of Todd Gurley and David Johnson atop the 2015 class, you ask? I’m all-in on Ameer Abdullah of the Detroit Lions. Abdullah was my number-one player in regards to overall performance above expectation, which combines his per-attempt and per-target data. And oh yeah, he did it in a “disappointing” rookie season. More on that later. Let’s quickly address the elephant in the room: Abdullah’s well-documented fumbling issues in college and his rookie season. If he cannot improve his ball security, then that could be what holds him back from a feature role in this offense, rather than his backfield competition. That said, there are a couple of star running backs by the names of Adrian Peterson and Jamaal Charles that have struggled in this area as well early in their careers, and I think their careers turned out okay. In college, Abdullah fumbled once every 35.4 touches. That stat does a poor job of showing his significant improvement in that area in his junior and senior years, however. In his first two years in college, he fumbled once every 19.5 touches. In his last two years in college, he cut that down to one fumble every 68.1 touches. In 2015, Abdullah was benched early in his rookie season after he put the ball on the ground four times in his first six games. Again, he showed improvement down the stretch, with just one fumble the rest of the season. Throughout his career, he has shown significant improvement as he has gotten more and more comfortable at each level. This projects well in terms of alleviating ball security concerns in 2016, and I am willing to place my bets on him continuing to improve in this area as he matures. 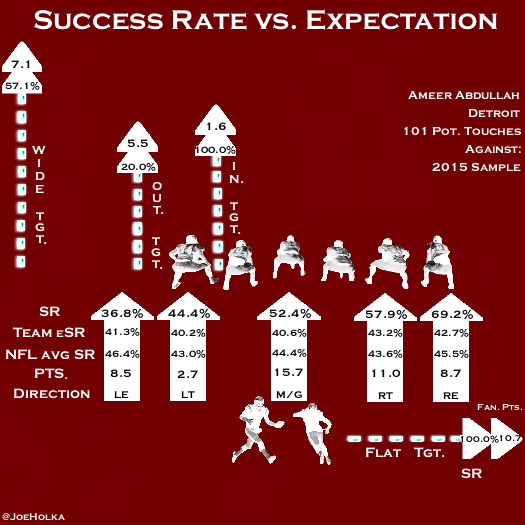 Abdullah’s displays elite balance and unique athletic ability, which is also highlighted by his 97th-percentile SPARQ score coming into the draft. His proficiency at bending runs at top speed is impressive. He has the hip flexibility to keep downhill at sharper angles than most backs. Though Abdullah’s long speed is very good, it is not elite. However, his acceleration is elite. He is absolutely dynamic in the open field, using his unique explosiveness and change of direction to his advantage often -- both behind the line and at the second level. Abdullah's run distribution most closely resembles Tevin Coleman's in Atlanta, as he has a lower percentage of his total runs through the middle than any other player in my initial sample. Abdullah took 47.0% of his carries behind either the left or right end, the highest amount of any player in my sample and 6.7% more often than the player directly behind him (Matt Jones). This isn’t to say Abdullah is bouncing everything outside. His mental processing is rare, and he makes good use of his creativity without trying to do too much. Abdullah has unique receiving ability and shows solid versatility and timing through various areas of the field. He lined up wide 41.2% of the time, more often than any running back in my initial sample. The next closest in this category was Dion Lewis at 40.0%. Expected Success Rate (eSR) is the signature metric of Rushing Expectation, and highlights the fact that not every Success Rate (SR) is created equal. If you are new to this series, you can learn more about this metric in my introduction video or article found here. It should be clear already that I am a fan of Abdullah’s real football talent from a film evaluation perspective. It’s hard not to be. The question is, did he exceed or fall below expectation in 2015 from an efficiency or metrics point of view? The overall eSR for Abdullah and the Lions was 41.1% per rushing attempt, the 22nd in the league, well below the NFL average of 44.3%. Detroit was equally unimpressive in pass protection, ranking 21st in overall expectation of any team at 42.7% eSR per target for running backs. The good news is the run blocking should vastly improve in 2016 with the addition of tackle Taylor Decker at 16th overall as well as offensive line man Graham Glasgow and Joe Dahl in the third and fifth rounds, respectively. Both Glasgow (center) and Dahl (guard) are interior lineman who should provide a boost for the run game going forward. Per attempt, Abdullah was most successful running to right end (69.2% SR), this was the second-best success rate of any player in the sample to this rushing lane. Abdullah was also well above expectation in four out of five running lanes. His highest distribution was through the middle, where he finished 11.8% above expectation. Per target, Abdullah was an absolute rock star in regards to efficiency in the passing game. 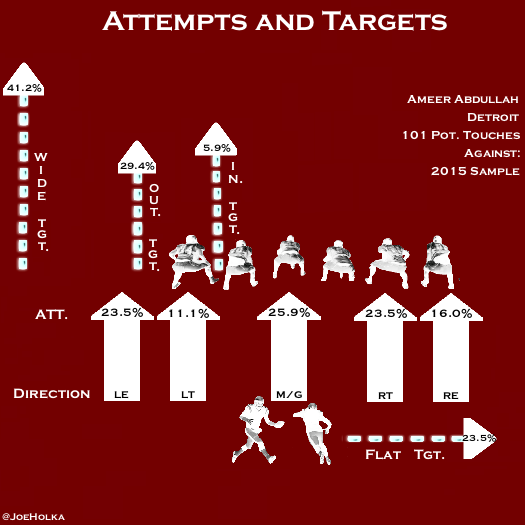 The sample was small, but on 20 targets, 29.4% of them went to the flat or inside areas of the field, and Abdullah boasted a 100.0% SR. It just shows how dynamic he can be when Detroit gets the ball into his hands using short, high-percentage plays where his rare instincts can shine through. Even behind horrendous run blocking and a horrible backfield situation, Abdullah’s overall efficiency numbers were immaculate. Let’s check out his overall Rushing Expectation results to see if there is something beneath the surface that can help explain this. Behind what was statistically a bottom-half run blocking offensive line, Abdullah performed above expectation in his 2015 sample by 10.8% in the run game and 16.1% above his eSR in the passing game. These efficiency numbers were enough to put Abdullah number-five overall in my entire 20-player sample in regards to percent above expectation on rush attempts and number-three overall per target. This is a combined 26.9% above expectation cumulatively, number-one in my initial 20-player sample. If I have learned one thing, it is that as a community we understate the importance of yards before contact at the running back position. Elusiveness behind the line of scrimmage and the ability to find small creases is much more important than long speed. Abdullah annihilated the rest of the pack regards to yards before contact, averaging 7.7 yards per attempt, a full 1.7 yards per attempt better than my sample average, and 0.8 better than the next closest player, Tevin Coleman. Abdullah's elite short-area burst allows him to get to the outside seemingly at will, but he is patient enough to use his blockers. Abdullah is the kind of player that has the ability to consistently turn bad situations into positive gains using his elusiveness behind the line of scrimmage. In regards to yards after contact, Abdullah showed average balance through contact, but was the third-worst running back in my sample at 2.9 yards after contact per attempt. The only players worse in this category were Charles Sims (2.8) and Jeremy Langford (2.7). Abdullah faced eight or more in the box on 22.2% of his runs, slightly below my sample average of 26.5%. However he was one of the few who actually had a higher success rate against loaded boxes than against soft ones. Abdullah’s above average vision led him to a 55.6% SR against eight or more in the box, third-highest in my sample and well above the sample average (43.0%). Abdullah is a mature runner who has solid strength and average power, but he rarely hesitates at the point of attack. Abdullah's struggles in pass protection date back to his college days. Concerns continue to be evident at the NFL level, as he was not trusted to pass protect on a regular basis. Abdullah will have to show improvement in this area -- in addition to ball security -- to be trusted in third-down situations more often. Abdullah has recently shed the no-contact jersey in practice, a positive sign that he is now fully recovered from his shoulder injury. There seem to be no concerns about his Week 1 availability. The backfield in Detroit is a cloudy situation at best at the moment. With the release of Joique Bell in the offseason, it now consists of second-round pick Abdullah, the 2015 reception leader at the position, Theo Riddick, and a the trio of Zach Zenner, Stevan Ridley, and Dwayne Washington vying for the “big back" role. Obviously the biggest fear regarding Abdullah’s fantasy prospects is that he could lead the team in rush attempts yet find himself in this strange in-between area where he is not the primary pass catcher or short-yardage back. This would severely cap his upside. I’ve said it before, but draft stock means a lot in the NFL. 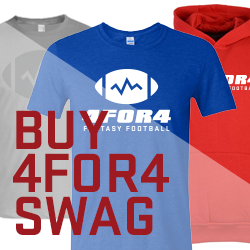 As much as Zenner has shown the potential to be a productive NFL player, Detroit has spent a premium pick on Abdullah. That matters. If Abdullah can gain the coaches' trust back from a ball security standpoint, his touches in scoring range will undoubtedly increase from his four touches inside the 10-yard line from a year ago. Riddick has carved out a huge role on this Detroit team. Over the last two seasons the Lions backfield has seen 159 and 167 targets. Riddick's 99 targets (second in the NFL) seems extremely likely to regress, as he was on the field for 470 snaps in 2015. Per Chris Raybon, “Cooter targeted his running backs 29% of the time, which would have ranked first over a full season.” With Bell’s 27 targets from a year ago up for grabs this leaves plenty of room for larger share for Abdullah in year two. Looking past the Bell departure, there is this guy named Calvin Johnson that demanded quite a bit of targets as well. Of course these targets could easily go to Golden Tate, Marvin Jones, or even Eric Ebron, if he can get healthy. The point is we don’t know and there are a ton of question marks. One scenario that could play out is Riddick will see the field more in the slot, moving Abdullah to more third-down snaps, although the Anquan Boldin signing admittedly muddles the picture even more. At the very least, Abdullah seems to be a player with a decent likelihood of increased opportunities. This was a tough one overall. There are so many reasons Abdullah’s situation should improve, but at the same time, so many question marks regarding his usage that scare me. Abdullah's talent level is just so enticing, and that is the kind of player I ultimately want on my fantasy team. The risks are substantial, but the good news is these risks are already baked into Abdullah’s price at his seventh-to-eighth-round ADP. This was not the case his rookie year, as he was going a few rounds earlier thanks to his stellar preseason. If you take into consideration Abdullah’s freak athletic profile, improved offensive line situation, and draft capital, to me Abdullah seems criminally underrated. We may have been a year early on this kid, but the breakout is imminent, and when it happens it is going to be big. Still not a subscriber? Join here! Rushing Expectation: Giovani Bernard - Tip of the Iceberg, or Floating Piece of Ice? 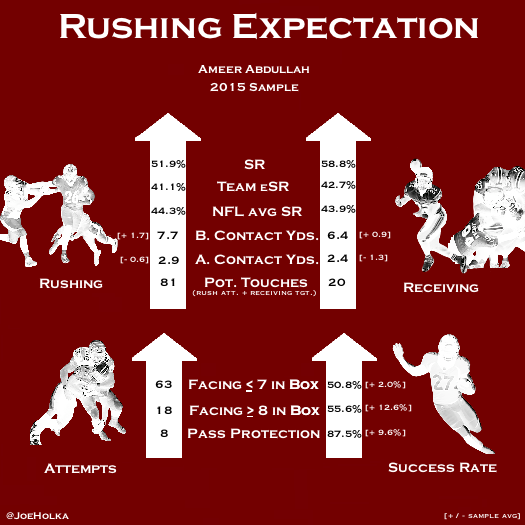 Rushing Expectation: Matt Jones - More than Just a Guy? Rushing Expectation: Latavius Murray - If a Tree Falls and No One is There, Does it Make a Sound?